The article, written by Irish journalist Kevin Myers, has been sharply criticised. 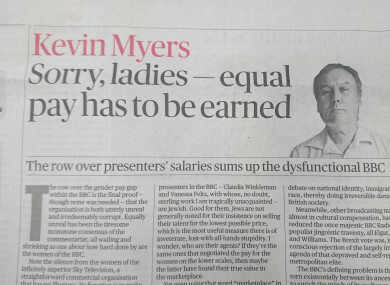 COLUMNIST KEVIN MYERS won’t write for the Sunday Times again after a column he wrote about equal pay for women was branded as “sexist” and “anti-Semitic”. The Sunday Times Ireland press office confirmed the decision to RTÉ News. Earlier today, the online version of the article was removed, and both editors of the British and Irish editions issued apologies. The opinion piece, which appears in the Irish print edition, is critical of recent calls for equal pay for men and women in media organisations, after the BBC published its list of highest-paid stars and only one woman made the top 10. Is it because men are more charismatic performers? Because they work harder? Because they are more driven? Possibly a bit of each. In a later section, the article highlights that the two highest-paid female BBC presenters are Jewish. It says: “I note that two of the best-paid women presenters in the BBC – Claudia Winkleman and Vanessa Feltz, with whose, no doubt, sterling work I am tragically unacquainted – are Jewish. Good for them. Jews are not generally noted for their insistence on selling their talent for the lowest possible price, which is the most useful measure there is of inveterate, lost-with-all-hands stupidity. The article goes on to speculate that Marian Finucane earns such a high salary for her RTÉ show because she may have a male agent. Senior management at the Sunday Times sent an apology to the Campaign Against Antisemitism after it complained about the article. Frank Fitzgibbon, editor of the Sunday Times in Ireland, said: “On behalf of the Sunday Times I apologise unreservedly for the offence caused by comments in a column written by Kevin Myers and published today in the Ireland edition of the Sunday Times. It contained views that have caused considerable distress and upset to a number of people. As the editor of the Ireland edition I take full responsibility for this error of judgment. This newspaper abhors antisemitism and did not intend to cause offence to Jewish people. The editor of the British edition of the Sunday Times Martin Ivens said the column was “unacceptable and should not have been published”. The contents of the article, and the decision to publish it, have received a very poor reaction from commentators on Twitter. Commentators said it was a “disgrace” that the piece had been published, while another pointed out that Claudia Winkleman has a regular column with the Sunday Times. Email “Sunday Times confirms Kevin Myers won't write for them again after offensive equal pay column”. Feedback on “Sunday Times confirms Kevin Myers won't write for them again after offensive equal pay column”.